After leaving champa gar dishom, the Santals again engaged themselves in search of plain and fertile land and came to Gangra Beda i.e Gang Gara Beda (ganga river valley). It was also a plain and fertile land, so they settled immediately. But they could not stay for longer time ,because the dikus came again. By that time Dikus had become more powerful than Santals. And as peace loving community did not want to involve itself into war with them.So they did not resist them because of which they had to move further towards the south following the down stream valley of river Ganga and ultimately they reached Chutia Nagar i.e. Chota Nagpur plateau. In this way the Santals were totally driven out from the valley of river Ganga. So no Binty says regarding the establishment of any kind of civilization in the Gang gara Beda, rather it says the condition of santals was very very measurable there, because where ever the santals cleared up the Jungles for their inhabitation and cultivation the dikus came in. So they could not get any chance to settledown properly and permanently. Therefore their economic condition became very wretched. 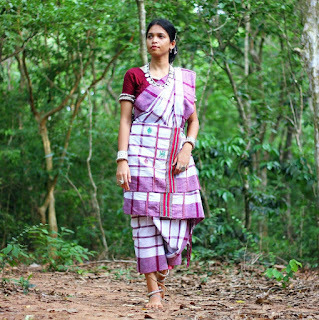 Binty says “when the Santals reached the chotanagpur plateau, they had no food to eat. Only they had their lives with them (sutuh sumung jiwi). The chotanagpur plateau was not a plain land. It was full of high hills all around. The santals settled down here and there where ever some what plain and cultivable lands were available in between hills or at the down of the hills. Anyway, by will of their hard labor, they managed to convert the ups and downs of the land into the cultivable plain land and produced different crops. This land is nothing but Santal pargana area of today situated in Jharkhand. Life of the Santal in Chhotanagpur plateau was quite different from Sasang Beda and Champa Garh Disom. In Sansang beda and champa garh disom. Most of the people were living in garh. i.e nagar or town. They were ruled by their own king kishu rapaj. But Chota Nagpur platuea, almost all the people lived the at village. The word ‘atu’ derived from the ‘ot’ which means holding capacity of an area. As the plateau was up and down with high hills all around the people did not get suitable lands at stretch for their habitation and cultivation, as a result of which they were bound to live here and there according to the holding capacity of an area. i.e Cultivable land available . Thus they started living in Atu i.e village, when the holding capacity of an atu became inadequate in comparison to the distance from the other so they lived there. In this way the Santal made different village in different places. Under the circumstance their way of life and mode of administration took a new turn. Instead of feudalism, they adopted democratic socialism . Every village was taken as an unit and its administration was vested upon Majhi, Parnik, jog Majhi, Naike who were the elected personnel of the village. Binty says, with the new social setup, the santals lived in Chotanagpur plateau i.e santal pargana very happily for many years, After the British came to India and penetrated in to the plateau to explore the minerals, their peaceful happy life got disturbed . Dikus (outsiders) again got the way to come in. They established themselves as Thika dar, Jagirda and Jamindar under the sadhow of British Government and exploited the santal people very much. Then santal people out of anger revolted against the British Government . Santals untiy led by Baba Tika Majhi in the year 1784 and santal revolution led by SIdo kanhu in the year 1855 were the main . From there revolution , then might British Govt. got to realize the consciousness and power of santals , and in order to suppress them forever seized to fire many santal villages causing the heavy loss of life and wealth .Later on few Santals migrated to different place. In this way the santals people spread from santal pargana area to other parts of the chotonagpur plateau. Now they are seen living hilly region of Bihar Bengal and Orissa M.P within the same range of Chotanagpur Plateau.